Dear Outer Space: Poetry book GIVEAWAY to celebrate National Poetry Month! 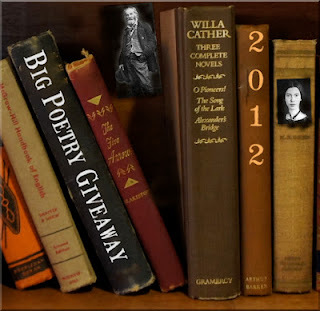 Welcome to the 3rd Annual Big Poetry Book Giveaway! This event is in honor of National Poetry Month and was started by poet Kelli Russell Agodon. If you want to participate and have questions about the process, check out Kelli's FAQs. If you're new to Dear Outer Space, here's a little background on me and my blog. I'm Laura. I'm a poet, writer, editor, and educator. I live in San Francisco where I teach poetry in the public schools for Poetry Inside Out and California Poets in the Schools. I'm also the founding editor of Weave Magazine, a biannual literary publication. My chapbook, Braiding the Storm, is coming out in September 2012 by Finishing Line Press. If you'd like to be included on my mailing list, sign up here. I write about a lot of things on Dear Outer Space. I like to interview other writers, review books, tell you about my day or upcoming readings, discuss hot literary topics. I like making lists. I love spreadsheets! I love a good sandwich, preferably one with cheese and condiments. I'm an extroverted homebody. I'm originally from Pittsburgh, Pennsylvania. I miss my hometown. My writing process changes a lot. My natural process involves me drafting something by hand and then forgetting about it for months, discovering it, typing it on my computer, putting it in a folder, forgetting I wrote it, rediscovering it months later, revising, eventually sending it out for publication. Sometimes I have spurts where I write five poems in a day. When I'm more disciplined, I write about one poem a week. In order to help improve by writing habits, I'm going to try to write a poem a day for NaPoWriMo. I like a tidy workspace. I'm hopelessly disorganized. I lose things often. I'm learning to not care about losing things often. Finally, I love giving things away! onto the...FREE POETRY BOOK GIVEAWAY! The first book in the giveaway is my forthcoming debut chapbook, Braiding the Storm (Finishing Line Press, 2012). I'd call this a coming-of-age collection of poems. A revolution of sorts. Here are links to a couple poems that are in the collection, to give you a taste. This chapbook will be published in September, so the winner will receive a copy in the fall. The second poetry chapbook I'm giving away is called Catch & Release (Seven Kitchens Press, 2012) written by my dearest and most awesome poet friend, D. Gilson. Catch & Release is the winner of the 2012 Robin Becker Prize. This fierce collection of poems grapples with the home, sexuality, religion, family, culture, and class. I can't recommend it highly enough. This book comes out this month, so I should be able to mail it right away. We only need to give out two books, but I'm offering a third chance to win! 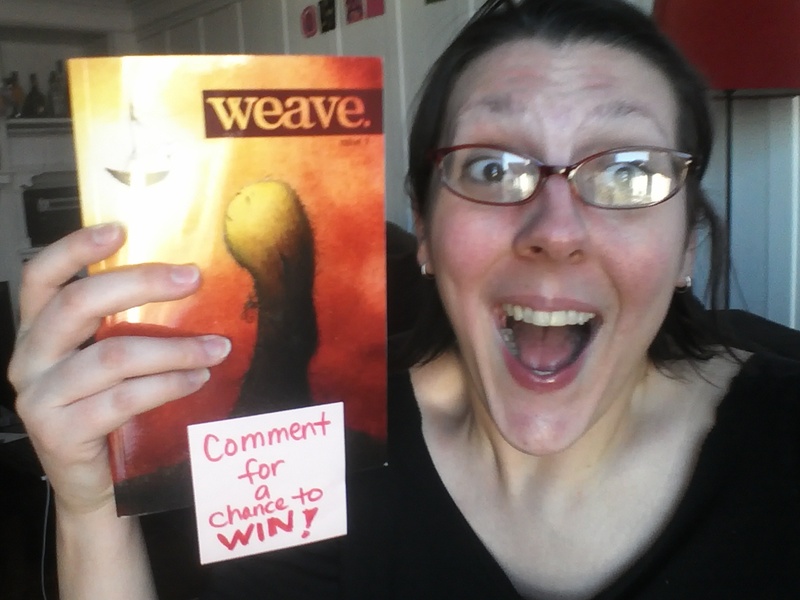 The third giveaway is a copy of issue 07 of Weave Magazine! This issue features poems from Noelle Kocot, Mary Stone Dockery, Iris Jamahl Dunkle, and Lawrence Wray, and includes fiction and nonfiction pieces as well. Copies are currently available. 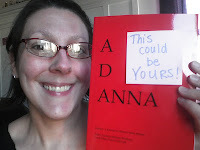 I realized I have an extra copy of the first issue of Adanna: A Journal for Women, about Women. Great first issue of a lovely journal featuring poems (and other genres) by Yours Truly, Molly Spencer, Sarah Sloat, and Carol Berg, among many others! This will be sent to the winner once chosen. There will be four winners total, two getting one of the chapbooks, the third getting Weave Issue 07, and the fourth getting Adanna Issue 01. Each entrant will receive a number based on the order of their comment. During the week of May 1st, 2012 I will randomly choose four winners from the entrants in the comments section using a random number generator. This drawing is open from now through ALL OF APRIL - which is National Poetry Month! TO ENTER, please leave your name and email address in the comment section by midnight (Pacific time), APRIL 30th, 2012 in the comment section of this post. It's that simple! So excited to share these books with new readers! What are you waiting for? Go comment! dockstone82@gmail.com. Mary Dockery. Boom. I think I did it right this time...Hehehehe. you did indeed! you'll be entrant #1! you are #3! thanks for entering! awesome! #4 you are. i don't know why Disqus puts comments out of order. oh well. yay for poetry month! Happy National Poetry Month to you too! It's going to be a fun one. You are #6! I've heard great things about both Weave and Adanna. I'd love to win! (And the books, too, of course). Thanks for spreading poetry love. The "Weave is awesome" picture makes me very happy! Happy National Poetry Month, dear friend, and my email address is c.s.tanski@gmail.com. Hi! It's great to virtually meet you. I'm from Pittsburgh as well. Thanks for such an awesome giveaway offer! Signed up indeed! Thanks Kathleen! #10 you are. Nice to meet you, Laura! All the books you are giving away sound great, and I would love to read more poetry before I start my MFA. Thanks so much for doing this! LED, I love the photos - they make me smile. Yes please enter me! These are exciting prizes! Count me in. Please throw my name into the hat, too! I'd love to win any of those books. Please count me in. Thanks for doing this. I'd like to enter. I know D. Gilson as well. Love him.